Computed tomography scan of the abdomen showing a saccular structure (as highlighted) at the confluence of the superior mesenteric vein and the splenic vein posterior to the pancreatic neck, measuring 36.5 mm × 53.7 mm × 52.1 mm. The mass enhances during the portal venous phase on contrast-enhanced computed tomography and is contiguous with the portal venous system. No compression of surrounding viscera appreciated. (A) Coronal section; (B) transverse section; (C and D) 3-dimensional reconstruction. A 59-year-old woman with no prior liver disease or portal hypertension presented with an episode of right upper quadrant pain that lasted for 3 hours. The patient had a history of cholelithiasis, which was diagnosed 3 years earlier. She denied any other symptoms. Her social and family history were unremarkable. Her examination was remarkable for right upper quadrant and epigastric tenderness, but Murphy’s sign was negative. Her laboratory tests, including complete blood count, basic metabolic profile, and liver function tests, were unremarkable. Contrast-enhanced computed tomography (CT) showed cholelithiasis without any evidence of acute cholecystitis. Additionally, she was found to have an incidental mass that enhanced during the portal venous phase, consistent with portal vein aneurysm at the confluence of the superior mesenteric vein and splenic veins posterior to the pancreatic neck, measuring 36.5 mm × 53.7 mm × 52.1 mm (Figure 1). 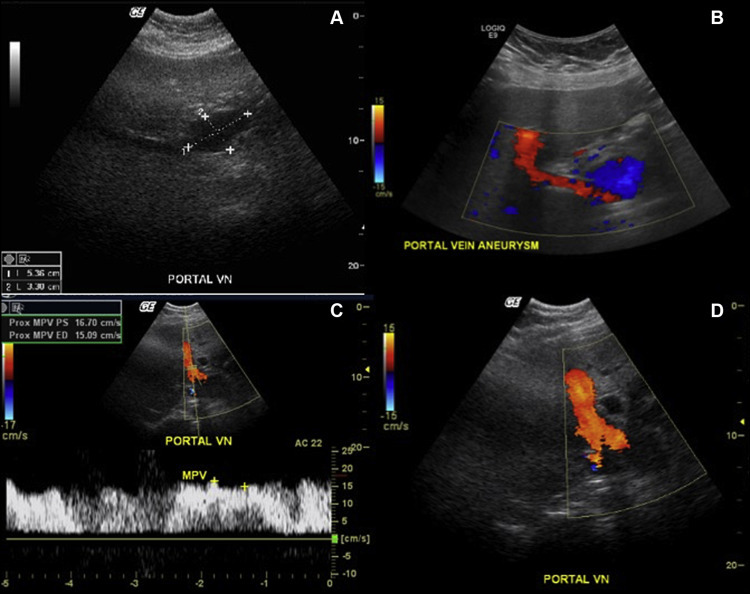 Subsequently a color Doppler ultrasound scan revealed an anechoic structure with internal blood flow (Figure 2) that was negative for any thrombus, visceral compression, or cirrhosis. The patient was diagnosed with cholelithiasis and incidental portal vein aneurysm. Unfortunately we did not have access to her previous abdominal imaging, and hence we could not determine her portal vein anatomy from 3 years earlier. Information on the size of the aneurysm, if it existed then, could have proved pivotal to her management decision. Currently she was asymptomatic, had no complications, and did not have any high risk for rupture like chronic liver disease, cirrhosis, or portal hypertension. Conservative management has been considered as a reasonable strategy in such patients.1Additionally, uncomplicated asymptomatic portal vein aneurysms up to 6 cm in size have been managed over the long term with regular surveillance,2 and there was lack of evidence showing benefits from surgery in such scenarios. Hence surgical intervention was deferred, and we decided to offer serial ultrasound surveillance for further management. The patient was agreeable to this strategy. A plan was made for elective cholecystectomy, and the patient was asked to follow up for surveillance duplex ultrasound after 6 months. At 18 months after the original diagnosis, on surveillance imaging her portal vein aneurysm has been stable in size without any complications or symptoms. Diagnosis of portal vein aneurysm is confirmed with appropriate imaging studies like Doppler ultrasound, CT, or magnetic resonance imaging (MRI). The main differential diagnoses of portal vein aneurysm are hyperenhancing abdominal tumors or liver or pancreatic cyst. On Doppler ultrasound, a hyperenhancing mass appears as a complex mass with arterial phase blood flow, whereas liver or pancreatic cysts are anechoic without any internal blood flow. In contrast, portal vein aneurysm is an anechoic cystic mass with monophasic internal blood flow (Figure 2). Complications like portal vein thrombosis can be easily appreciated on ultrasound. It is cheap and does not expose the patients to radiation, making it an ideal tool for surveillance. In addition to ultrasound, CT or MRI may be used to differentiate portal vein aneurysm from a hyperenhancing abdominal mass or pancreatic cyst. 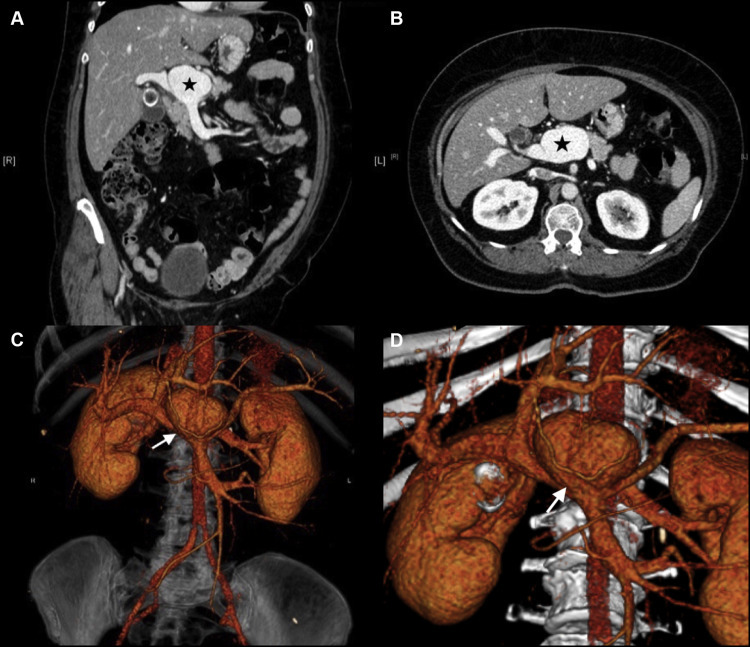 In contrast to a hyperenhancing abdominal mass, on CT scan portal vein aneurysm would appear as a thin-walled structure isoenhancing with the portal venous system, and unlike pancreatic or liver cyst, portal vein aneurysm will enhance on the venous phase of contrast-enhanced CT (Figure 1A and B). In addition, both these techniques provide excellent delineation of the surrounding architecture. Hence, complications like compression of the surrounding viscera and rupture can appreciated on these imaging modalities. Computed tomography scan or MRI are also necessary before planning any surgical intervention.